H2O has a long and successful track record in providing event support ferry and barge services, as well as stand-by boats to customers organising the most prestigious events on Sydney Harbour islands and around the harbour itself. Organising an event on the world famous Sydney harbour demands the best and most professional team to support it. To find out more about our services please click on one of the links below or call us on 1300 420 829 (or 02 9817 1753) or email to discuss your specific requirements. 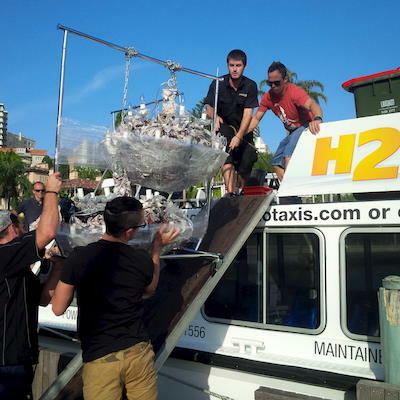 H2O’S water taxis are maintained to the highest standard with comfortable seating and panoramic windows. In addition, we have digital TVs and stereo systems, enabling you to keep your guests engaged with event specific media (or you can just let them relax and enjoy what they want). Boarding our boats is comfortable and safe; with bow loading there is no gap between the wharf and the boat and you can step straight on, so there is no getting those new shoes scratched or those new clothes torn or dirty. We can ensure a smooth and comfortable passage for all your guests. H2O has the water taxis and the people to make it a comfortable and enjoyable trip on the water for up to 68 people per taxi. Fully weatherproof boats with panoramic windows. When people travel on Sydney Harbour they want to be able to see the world class views. Our panoramic windows enable them to do this from the comfort of their own seat. Depending on numbers and the speed of the transfer, a few people may be able to stand on the foredeck and enjoy the view from there. Our boats can carry up to 33, 49 or 68 passengers each, so transferring large numbers of people on time isn’t a problem. Whether its 20 people or 200+, we have the comfort and capacity to ferry them safely across the harbour in our maxi water taxis. We are expert at doing shuttle runs and organising passengers to ensure we remain on schedule. We are like a mini ferry, but with the ability to get into some of the shallower and tighter wharves at any tide. Our twin V8 Yamahas also give us great manoeuvrability. The bow loading on our boats means that the transfer from land to water and vice versa, is done safely and effortlessly. H2O can barge up to a tonne of equipment at a time across Sydney Harbour. Whether it is an awkward shape, unusually long or a tonne of gear, we can help! With a loading area of 6 metres by 3 metres and the ability to carry 1 tonne of gear we can deal with most requirements. We have a long and varied experience of carrying just about every type of cargo across the harbour. Whether it is bulky, delicate, heavy or fragile we have surely dealt with it, or something very similar! Chandeliers, road cases, camera equipment, chairs, generators, the list goes on, if you can lift it (well OK, if two of you can lift it!) we can barge it across the harbour. Our skippers are experienced in ensuring that your cargo gets the smoothest and driest transfer on our maxi taxi barge. 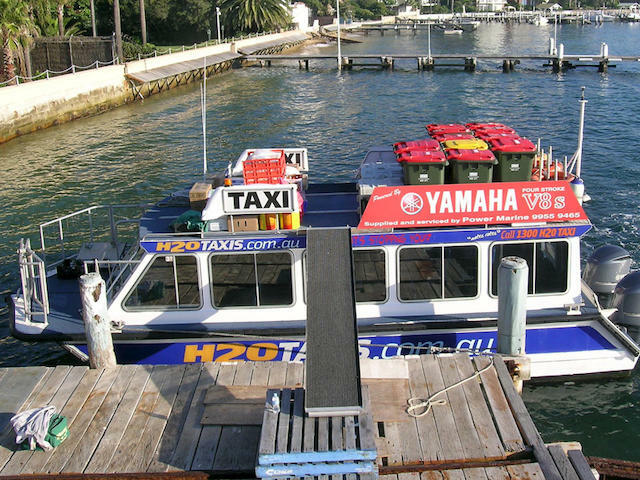 Our maxi water taxi acts as a barge and is an ideal way to transfer your gear. Given the compact size of the boat and the shallow draft we can get into most wharves around the harbour at any tide. Our maxi barge is also available for hire by the hour, which gives you greater flexibility and enables better budget management for your event. We load the cargo onto the roof of the boat. We know the best wharves for loading and unloading and can advise you on tide times and the best timing for doing the job. In fact it is possible to load and unload at most wharves, providing the cargo isn’t too heavy or bulky. With our loading ramp, the job is made a whole lot easier. Whether you want to book with us now or if you are still wondering if we can do it, give us a call on 1300 420 829 or 02 9817 5333 or email us on and we can talk you through the possibilities and give you a price. 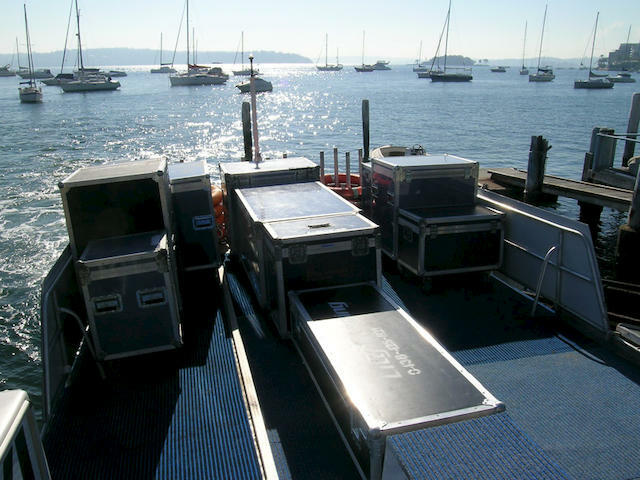 H2O can provide a stand-by boat for that often critical situation that the organisers or VIPs have the comfort of knowing they can move off at any time. 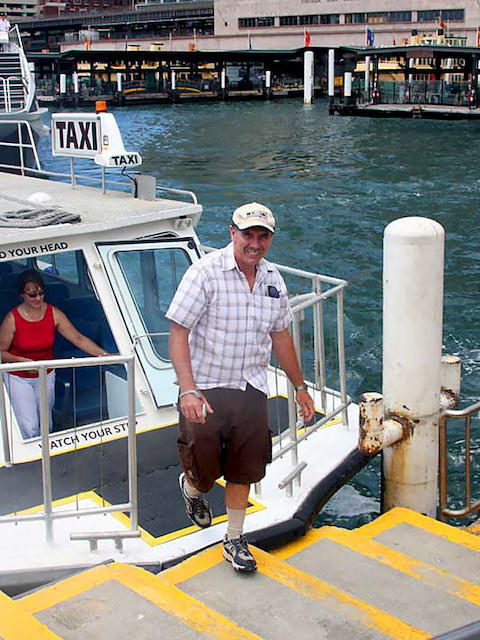 You will be surprised how quick water taxi transfers can be. For instance Manly to Circular Quay can be done in just over 20 minutes – beat that at rush hour! Even Watsons Bay to Circular Quay is an impressive 15 minutes. 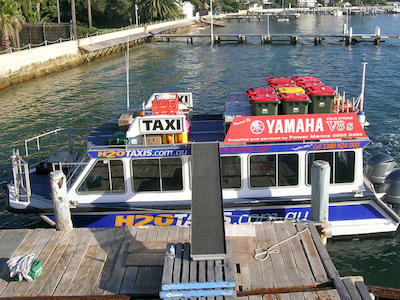 So if you need to get somewhere quickly our maxi water taxi is the way to go. Also, with our free wifi and digital TV on board your organisers and VIPs wont lose touch with vital communications whilst on their transfer. We can offer our boats on a stand-by rate which is calculated assuming they are only needed for the unexpected situation. If you need us on stand-by, we can offer very competitive rates for those situations. H2O provides a spectacular way to see and learn about the harbour, whether it is part of the event or an extra that attendees or their partners and families can attend. If you only have an hour, why not try H2O’s harbour highlights tour. This gives you the chance to photograph the world heritage listed Opera House and the Sydney Harbour Bridge from a position few get to see! Alongside that we can show you some of the more important harbour side properties and Fort Denison, as well as tell you some stories about the places and names. If you have longer, or even all day, we can take you out and explore the whole harbour from the centre of Sydney to Manly. With the chance to get off and explore as well as enjoy the views from the boat, this is the best way to see Sydney and its magnificent harbour. Learn about the natural harbour and see both the natural and man-made features of this world famous harbour. Alternatively H2O can help you design your own tour whether it is for an hour or two or all day. Our wharf map shows where it is possible to land on the harbour (though some sites may require permission), so you can start planning right now! To find out more and discuss pricing give us a call on 1300 420 829 or 02 9817 533 or email us on and we can talk you through the possibilities.